When I first wrote about the Glide TV Navigator five months ago, I didn’t realize I’d get involved with the company and help them develop and release their “What’s On” service. But that’s where we are today and therefore, a disclaimer is in order. I worked on this project and am therefore biased. As a second disclaimer, I write this as myself, not as a representative of Glide TV. These are my own interpretations and are not endorsed nor necessarily supported by the company. It’s a web site that provides a searchable and browsable catalog of video content provided by sites like Netflix, Hulu, Amazon, etc. presented in a nice “scrollable video wall” interface designed for the living room. What’s On is designed for use on a computer connected to a TV. It works on a laptop or desktop PC or Mac, but it really shines when used with the computer connected to a TV, where typical websites are difficult to read and use from across the room on the couch – What’s On provides an interface that is specifically designed for that case, to be effective and enjoyable from a TV watching distance. The “What’s On” home page provides a collage of video thumbnails for what is most popular right now. The collage contains popular Movies and TV episodes as well as up to the minute News and Sports stories. The home screen “wall” uses essentially the same “scrollable video wall” user-interface used throughout the site, including search results. Click the left or right “arrows” that appear transparently over the video wall, to scroll the wall to the left or right – quickly scroll through dozens and dozens of videos. When you mouse over a video thumbnail, the full name for that video will be displayed; if it’s a TV episode, the season and episode number will be shown. 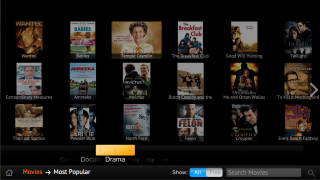 From the Home screen, the links along the bottom select categories of videos: Movies, TV, Music, News, and Sports. There is a “Genre” slider just below the video wall where you can narrow the videos by Genre, such as Action, Drama, Comedy etc. On the bottom menu is a “Free filter” button, with the options “All” and “Free”. By selecting “Free” only videos that have a free source will be displayed. This is handy when you are not in the mood to wade through $2.99 videos. When you click a thumbnail, you will see the details page for that video (or TV Show), showing information like the rating, the runtime, the cast and crew, and a full description. Also will be the links to watch the video, as shown above. In some cases, the video can play embedded within What’s On, in other cases you will be taken to the source site to watch the video. When you go to the details page for a TV show, the information for the show will be displayed, along with a link to either Free episodes (if any episodes are available free) along with a link to all episodes, and showing the number of free episodes available. Searching from the home page searches across both Movies and TV. Searching within a category, such as News, searches only that category. If a genre is selected, results will be limited to just that genre within the current category. Furthermore, if the “free” mode is activated, only free videos (if any) matching the search will be displayed. Note: a quirk, “free” when searching, includes Netflix instant watch videos. Unlike TV and Movies, these categories are less formally organized. They contain more clips and less full-length episodes. This is simply due to the kind of video content that is available on the Internet in these categories. The “video wall” in these categories have an added unexpected benefit, especially News and Sports, quickly giving a visual indication of what is being talked about around the world right now. As with Movies and TV, these categories also have a Genre slider below the video wall. They do not, however, have the “free” mode because all the videos in News, Music, and Sports are currently all free videos. 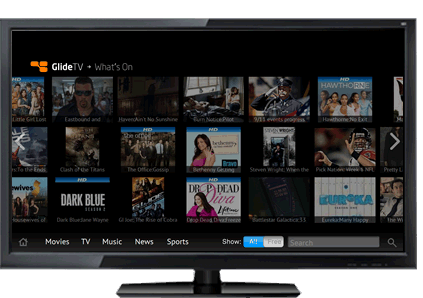 The What’s On service was really designed to work with the Glide TV Navigator using the custom GlideTV browser, on a television set, at one of the HDTV resolutions, either 720p (1280×720) or 1080p (1920×1080). It was only very recently decided to open the site up to anyone to use, even without the GlideTV browser and Navigator hardware. Therefore the site still works best with the GlideTV browser full screen at 720p or 1080p. If you don’t use it full-screen, for best results, you want to shape your browser window to the shape and size of a TV, or near to it, either 1280×720 and 1920×1080 are best, but something close to that will work. The main thing is for whatever height you have your browser window set to, make it wide enough to see at least 5 thumbnails across on the “video wall” and so that the bottom menu is not squished/overlapped. The site works best in Firefox, but is also usable in Safari and Chrome (and maybe IE7 or newer). This is the first release of this service. We made compromises to get it out the door. Obviously there is room for improvement and there are a number of features planned (most notably more filtering and sorting options). We could really use your (constructive) feedback. Thanks!